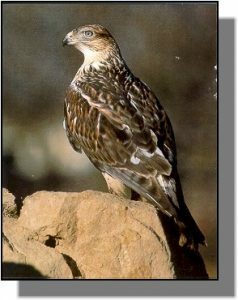 Comments: The ferruginous hawk is the largest Buteo hawk in Kansas. When seen in flight the rust-colored feathers of the legs show up well against the light-colored abdomen and light, unbarred tail. When the wings are in the downstroke a white patch can be seen. Up to 10 percent of the population may be a dark morph, making identification challenging, but the white patch in the wings should still be evident. Distribution: They are found in grassland habitats throughout the Great Plains and western United States. In Kansas, they are most often seen in the western part of the state. The majority of Kansas’ nesting birds is found in the chalk formation along the Smoky Hill River. Food: This large hawk’s primary food source is small mammals with a preference for prairie dogs, ground squirrels, gophers and jackrabbits. Occasionally snakes, birds and large insects will also be eaten. Their hunting techniques include high soaring, hovering, low quartering over fields, or even sitting near a burrow waiting for an opportunity to strike.